This vine looks great climbing up shrubs in your landscape. In addition to attracting hummingbirds, it isn't aggressive and won't smother the plant supporting it. 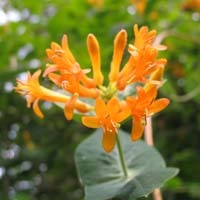 It has attractive clusters of orange trumpet shaped flowers.